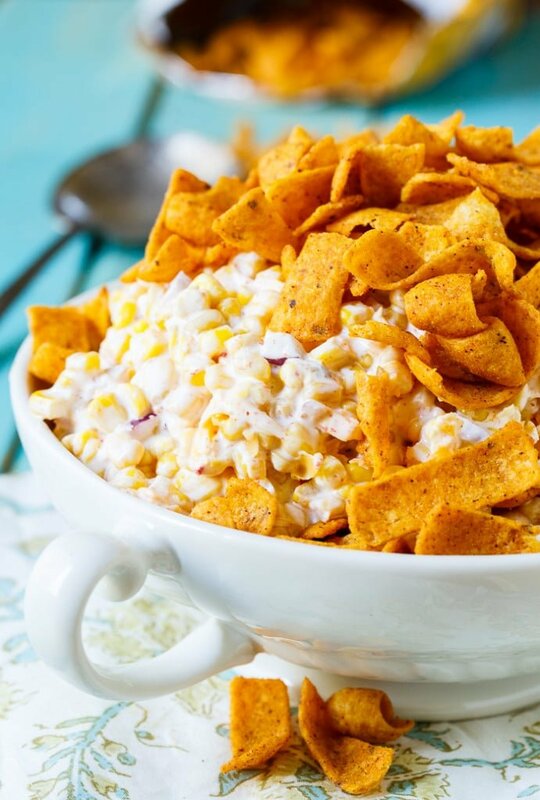 Frito Corn Salad is wonderfully creamy with lots of shredded cheddar cheese and crunchy, salty Frito corn chips. Great for summer potlucks and picnics! 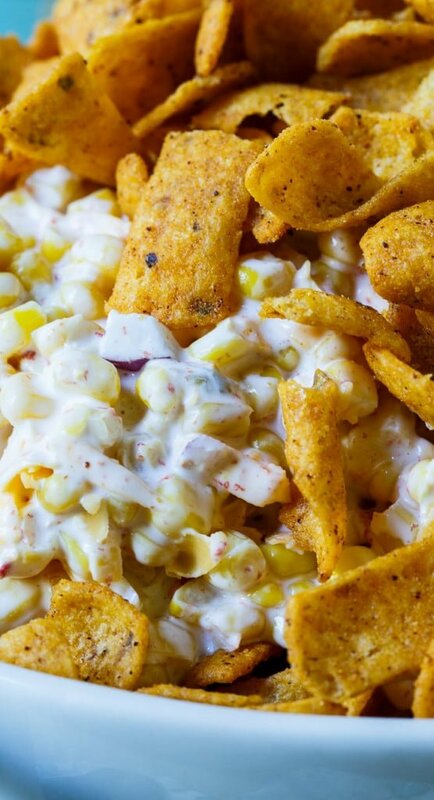 Frito Corn Salad is something I find to be absolutely addicting. Seriously. If there is a bowl of this on the counter, I will not leave its side. 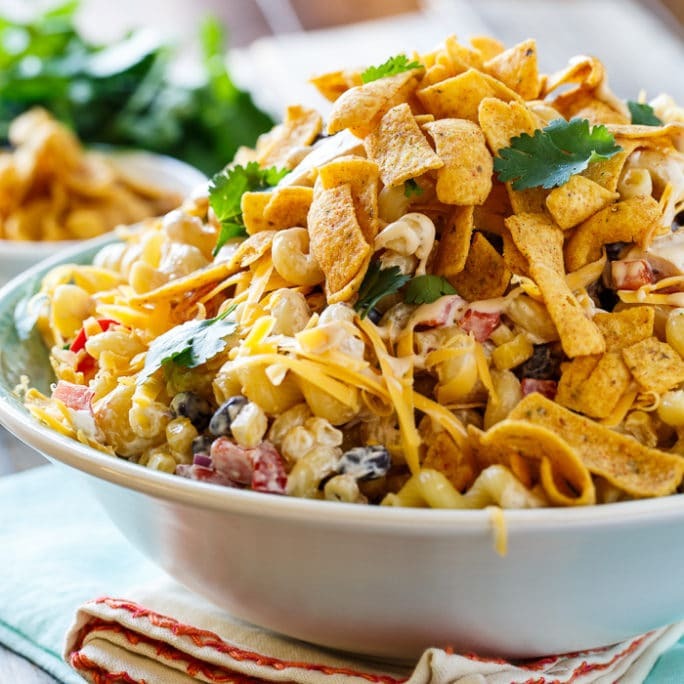 So wonderfully creamy with lots of shredded cheddar cheese and crunchy, salty Frito Corn Chips. I used Chili Cheese-flavored Frito Chips but BBQ or Ranch flavored corn chips taste awesome as well. 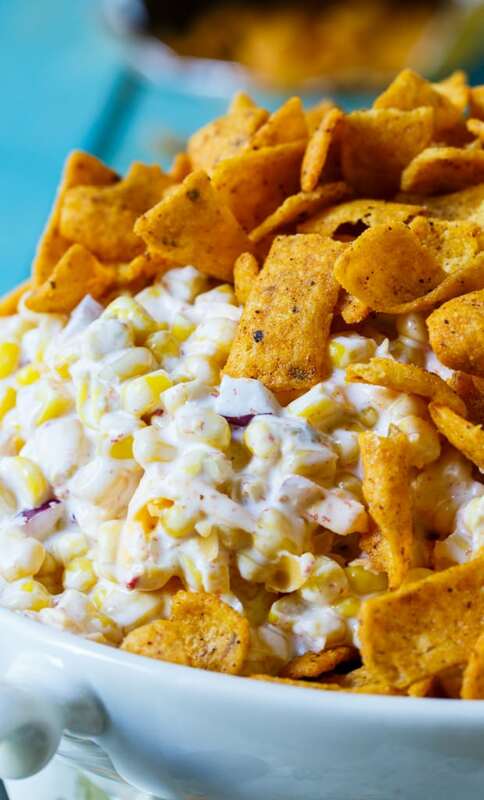 Made with canned corn, Frito Corn Salad is a breeze to make and is a fan favorite at potlucks and picnics. 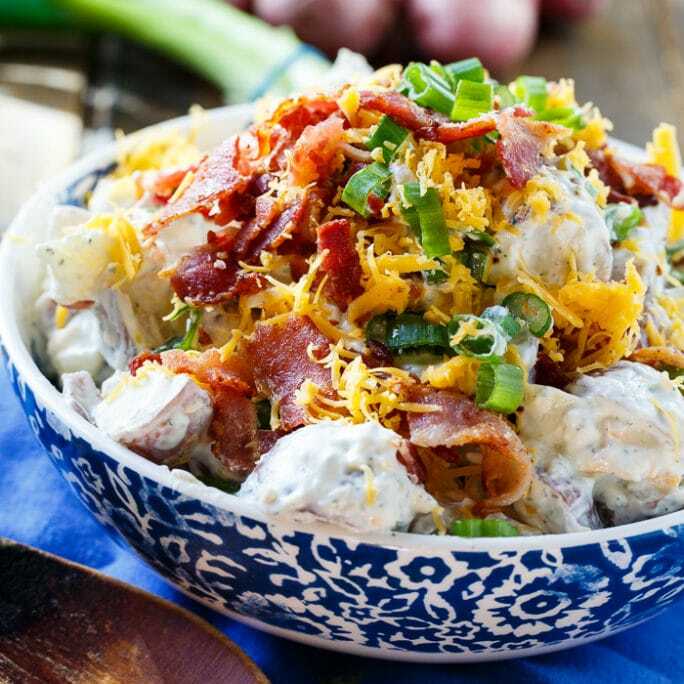 A combination of mayonnaise and sour cream makes it super creamy and some diced red onion gives it a little bite. It can be made in advance. Just remember to add the corn chips last thing or they will get soggy. Or you can even serve them on the side and use them to scoop the corn salad as a dip. So good!! Never miss a recipe. Follow Spicy Southern Kitchen on Facebook, YouTube, and Pinterest. Frito Corn Salad is wonderfully creamy with lots of shredded cheddar cheese and crunchy, salty Frito corn chips. Place corn in a large bowl. Add onion and cheddar cheese and stir to mix. 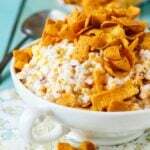 Just before serving, sprinkle corn chips on top. This entry was posted in Side Dishes and tagged corn, potluck. Bookmark the permalink. Amazing. I used Chili Cheese Fritos – YUM! I only used half the onion, but added a small can of diced green chiles; also subbed in a mexican blend cheese instead of cheddar. It turned out amazing! I made this for a Memorial Day cookout and it was a hit. Thank you for sharing!! I’ve had it before at a potluck and I couldn’t stop eating it! I plan on making this for a party I am going to on Labor Day weekend. I think I will use Frio Scoops instead. Although these don’t come the flavors you listed…..maybe I will a mix of Fritos. This sounds really good! Hope you enjoy it Barbara! It looks addictive and so perfect for the season! I’ve had walking tacos before, but I’ve never seen any other food with Fritos in it like this. What a fun side! This would be everyone’s favorite at a barbecue. I could tear that up! Chili cheese Fritos are one of my weaknesses! Christin, my daughter and her friends are planning a bunch of cookouts this summer and I know they will so love this! Thanks so much for sharing it – and I love the fritos on the side idea! This is such a fun twist on salad for the summer! It would be SO perfect at a barbecue (and since the sun is shining I’m itching for summer barbecue season to get into full swing)! Wow! This looks like the most perfect salad, Christin! 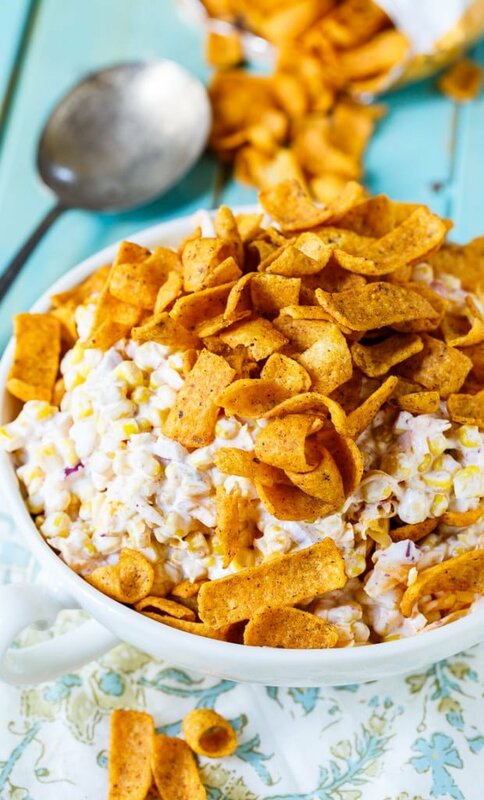 Corn dips and salads are my absolute favorite, but adding in fritos is just a genius idea!